I often get angry when I walk around Hong Kong. This is one of the most fascinating cities in the world to explore — densely layered, pulsing with energy — but it’s also one of the most frustrating because of all the ways the pedestrian experience is undermined and made unpleasant. In the city with the lowest car ownership rate in the developed world, pedestrians are treated like second-class citizens. 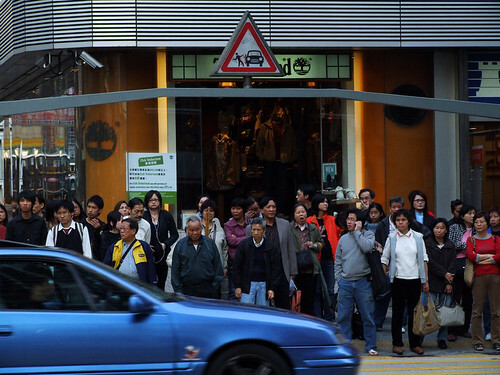 Designing Hong Kong recently launched an interesting new initiative called Missing Links, which is lobbying the government to improve pedestrian linkages around the city. One particularly egregious example is Salisbury Road in Tsim Sha Tsui, which runs parallel to the harbourfront in Tsim Sha Tsui. In the past, crosswalks allowed pedestrians to easily walk to the waterfront, but a major traffic engineering project about 10 years ago removed all surface-level crossings and forced pedestrians into a confusing system of underground passageways. Walking through them is not much different from being a rat in a maze. To say it’s a dispiriting experience would be an understatement: if life is a series of tile-walled tunnels, I’ll take the next exit out, thank you very much. This is just one example of what’s wrong in Hong Kong. What’s even more outrageous is the systematic denigration of pedestrians in the city’s entire network of streets. There are the legendarily narrow sidewalks, made even narrower by the presence of roadside fences that eat up valuable pedestrian space. When a sidewalk becomes overcrowded, it isn’t widened, it’s fenced in, the way the jam-packed sidewalk of Dundas Street was fenced in when too many people started walking in the street. Crosswalks at major intersections are generally too narrow and surrounded by fences that create artificial choke points. Minor intersections have absolutely no provisions for pedestrians: no crosswalks, just a “Look Left” or “Look Right” sign painted on the asphalt. Pedestrians are meant to wait for oncoming vehicles, which always have the right of way unless there is a zebra crossing. And while there are zebra crossings here and there, usually in very quiet parts of town, in recent years they have become even more endangered than the animals for which they are named. Anyone who has walked the streets of Hong Kong will be familiar with what I describe, but just in case you haven’t, here are some examples. Below is the corner of Shanghai Street and Arran Street, not far from my apartment in Mongkok. It’s a busy pedestrian crossing, but notice there is no crosswalk and nothing that would slow down traffic, like a corner bulb-out. Instead, people must wait until traffic clears and hope that a vehicle doesn’t come careening around the corner. Below is the corner of Nathan Road and Argyle Street, one of the busiest intersections in the city in terms of both pedestrian and vehicular traffic. Notice anything missing? It’s a crosswalk: there are only three. People walking along the north side of Argyle Street are not able to cross Nathan Road. This is the kind of traffic planning normally found on suburban thoroughfares surrounded by strip malls. Can you imagine the City of New York removing one of the pedestrian crossings at 5th Avenue and 42nd Street? To make matters worse, the government has seen fit to decorate each of the three existing crosswalks with archways depicting a pedestrian being struck by a car. Finally, here’s Mong Kok Road, a very busy thoroughfare with a lot of bus traffic. In order to accommodate the masses of pedestrians that need to get through here, the government built a big footbridge above the road — a kind of elevated highway for pedestrians. Not a bad idea, except they used it as an excuse to turn the surface level of Mong Kok Road into a dank, exhaust-filled hellhole. What makes all of this especially outrageous is that Hong Kong has just 77 cars per 1,000 people — less than half the number of Singapore and one third the number in New York. Just 10 percent of people get around by car. Almost everyone else — 90 percent of the population! — gets around through a mix of walking and public transportation. So why is such little thought put into the pedestrian experience here? I have a few theories. 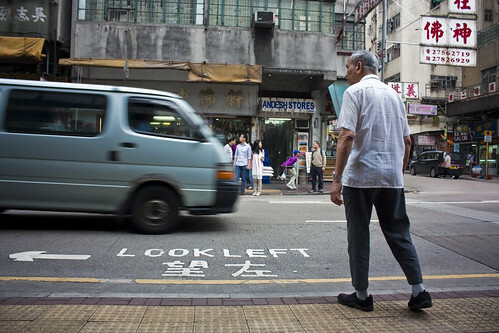 One is that Hong Kong’s transportation planners don’t see pedestrian needs as especially important; they see them as equal to the needs of other road users, like buses, taxis, trucks and private vehicles. They design streets to allow for the greatest possible traffic flow with the fewest possible conflicts between road users. But this approach always puts pedestrians at a disadvantage, because motor vehicles so easily dominate a space. In order to achieve true balance, you need to aggressively favour pedestrians: wide sidewalks, corner bulb-outs that slow traffic, plenty of surface crossings. Of course, for that to happen, Hong Kong requires a progressive traffic management strategy, one that seeks to reduce the overall number of vehicles on the road. Instead, the government is content merely with managing the growth of traffic, postponing real action until it becomes even more of a crisis. (Anyone who doesn’t see the need for reducing the number of vehicles on the street should take a look at the latest roadside air pollution index — 108 or “very high” as I write this.) Between 2000 and 2012, the number of vehicles on Hong Kong’s roads increased by 24 percent, compared to a 4.4 percent increase in population. During the same period of time, the number of private cars jumped by 33 percent. Another problem is education. Drivers here seem completely oblivious of pedestrians; take a look at their faces when they whip around a corner, forcing people to rush out of the way or stop abruptly in their tracks — it’s like a shark plowing through a school of fish. When they do see pedestrians, they see them only as a nuisance. Imagine how frustrating it is to have a driver honk at you simply for having the gall to cross the street at your own pace. I once broke an umbrella in half when I smashed it against a minivan that cut me off as I was crossing the street (not something I’d advise, by the way — I lost an umbrella and didn’t even dent the van). The driver hesitated for a second, looked back at me and sped off. Of course, bad drivers are to be expected. They’re part of the price of living in a big, congested city. But what I can’t stand is the way they are enabled by anti-pedestrian street design and official attitudes. That has got to stop. This entry was written by Christopher DeWolf , posted on Wednesday April 17 2013at 04:04 am , filed under Asia Pacific, Environment, Public Space, Transportation and tagged Hong Kong, Kowloon, Pedestrians, Traffic, Urban Design . Bookmark the permalink . Post a comment below or leave a trackback: Trackback URL. Totally agree with you. Was in Kowloon and Mongkok recently and also saw the fences and kept having to walk around them to cross the roads – in Singapore I often experience the same sort of rage at seeing railings along roads where basically they want to prevent jaywalkers (even on roads which aren’t so busy). Not surprised SIngapore suffers from the same problem as HK, given they seem to share similar approaches to planning. I still haven’t had a chance to visit Singapore but I’ve spent a lot of time looking at it on Street View. One thing that surprised me is how any low-density, car-oriented areas there are, despite the very high cost of owning a car and all those famous congestion charges. Look at the bright side. If this were NYC, aka Bloomfukingstsan, you would get pepper sprayed and beaten for stepping off the curb. “Hong Kong is one of the most fascinating cities in the world to explore?? ?” Please take a moment to consider the absolute absurdity of that statement. You might want to elaborate.